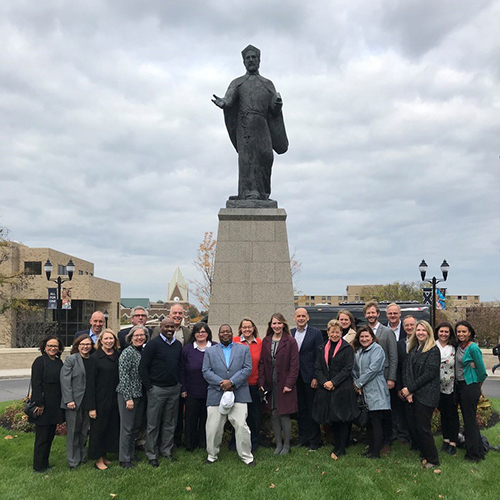 Nearly two years have passed since members of the AJCU Marketing & Communications Network met at Loyola University Maryland to plan a collaborative advertising campaign in conjunction with Pope Francis’ first visit to the United States later that fall. Since then, we have met again at Xavier University and Creighton University to discuss ways that our network could build upon the 2015 Pope Francis / Jesuit Educated campaign and continue to promote Jesuit higher education through social media and other creative platforms. Congress passed the Consolidated Appropriations Act on May 5th, which was then signed into law by President Trump. This bipartisan omnibus act was a continuation of efforts from the last session of the 114th Congress. FY17 appropriations for higher education were, for the most part, positive. Christopher P. Puto, Ph.D. is the thirty-seventh president of Spring Hill College in Mobile, Alabama, and a proud, Jesuit-educated member of the Spring Hill Class of 1964. Dr. Puto recently discussed his years of professional experience in higher education marketing with Spring Hill College’s chief marketing officer, Donna Heroux. Last November, the College of the Holy Cross Crusaders played the Fordham University Rams at Yankee Stadium in Bronx, NY to compete for the 31st Ram-Crusader Cup. While the premise for this event was football, it went well beyond a game. On the Holy Cross campus in Worcester, MA, it was a major collaboration between athletics, advancement and alumni relations, and college marketing and communications. The College viewed the game as an opportunity to tell its story more broadly in a new market: New York City. As Fairfield University turns 75 this year, we are reminded how deeply our Jesuit identity has shaped our institution, and the lives of all of the members of our University community over the years. Despite the passage of time and the dramatic changes in campus culture, the Jesuit mission of forming men and women for others has continued to inform everything we do. The Catholic intellectual tradition has grounded our core curriculum through its broad humanism and commitment to reasoned inquiry. At the start of the 2016-17 academic year, Le Moyne College launched a new marketing campaign centered on the theme, "Greatness meets Goodness." The message conveys Le Moyne’s mission to educate men and women who not only have the capacity to succeed, but the will to use that success to aid the wider world. Over the past two years, professional photographer Robert Macaisa (LMU ‘14) and writer Chris Yates (LMU '16) photographed twenty-two Jesuits who live at Loyola Marymount University’s Jesuit Residence. The result was a photography book called Emmaus: The Nature of the Way. Through the juxtaposition of formal and informal portraits, paired with word-for-word anecdotes about conquering alcoholism, escaping Vietnam during the war, handling a mother’s sundowning episode and more, Emmaus: The Nature of the Way aims to shed light on the humanity of these men. Five years ago, faculty and staff from Santa Clara University and the University of San Francisco (USF) partnered on an experiment in friendly competition: which university could accumulate the most minutes of movement in a month? That competition has expanded exponentially in each subsequent year, to the point that 20 of the 28 Jesuit institutions are now engaged in the Go Move Challenge. As we near the end of the 2016-17 academic year, we want to share some highlights from four Jesuit institutions that are celebrating milestone anniversaries. Looking ahead, Saint Louis University (SLU) will be the next Jesuit institution to celebrate a milestone: on September 23, 2017, SLU will kick off its Bicentennial with a Mass under the Gateway Arch in St. Louis, MO. Eric Immel, S.J. is a Jesuit regent of the Midwest Province of the Society of Jesus. He works at Arrupe College in Chicago and writes for The Jesuit Post. This article was originally published by the Midwest Province and is featured in Connections with permission from the Province. The Association of Jesuit Colleges and Universities (AJCU) sponsors over 30 conferences (affinity groups) within the AJCU Network. Most of the AJCU conferences host meetings at least once a year, and many of them facilitate regular communication among members through listservs. Click on the title to find out which AJCU conferences and affiliated Jesuit programs and events will be held this summer and fall.